There are areas that I think need changing... but it is a gradual process so the next one will reflect the changes. 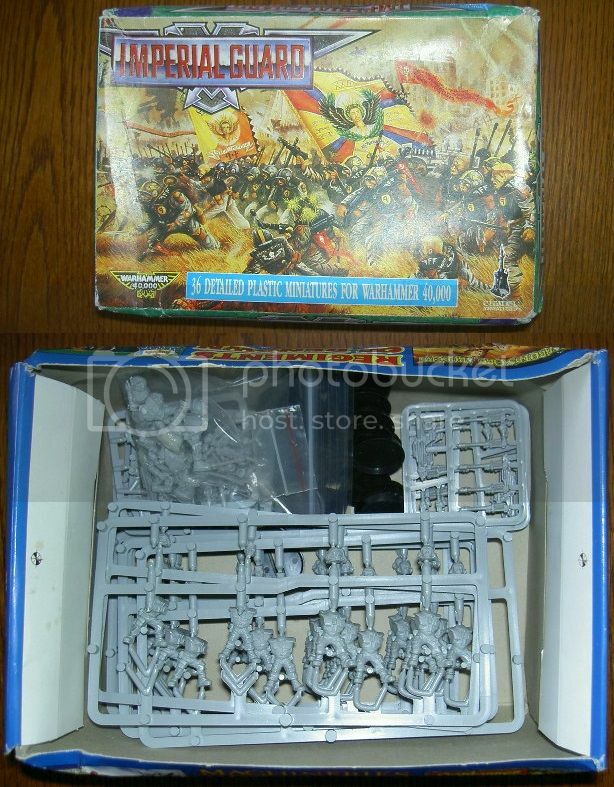 I have enough bolters, Catachan Lasguns, Cadian Lasguns and the ones that came in this box of guard... which weapons do you think would be best for the troops (I am not sold on the old school lasguns ). Thats a very nice and convincing conversion. Regarding the weapons, I have a similar dilemma with mine. The trouble is a lot of alternative options might look a bit bulky for them. I have a pile of Heresy ganger weapons so I might give them a try. Liking that a lot Inso. Your paint improves. And the base is better for no paint. Now it is painted it looks even better. This conversion really works in my book. Are you tempted to do them all as grymm? Or maybe some human allies? Further to my above post I can confirm that the Heresy assault rifles are a good fit for these guys and might look more in keeping with the grymm weapons. They cost 20 p each if i remember rightly. (i might use them as bolters with underslung auxiliary grenade launchers for my Rogue trader stuff). 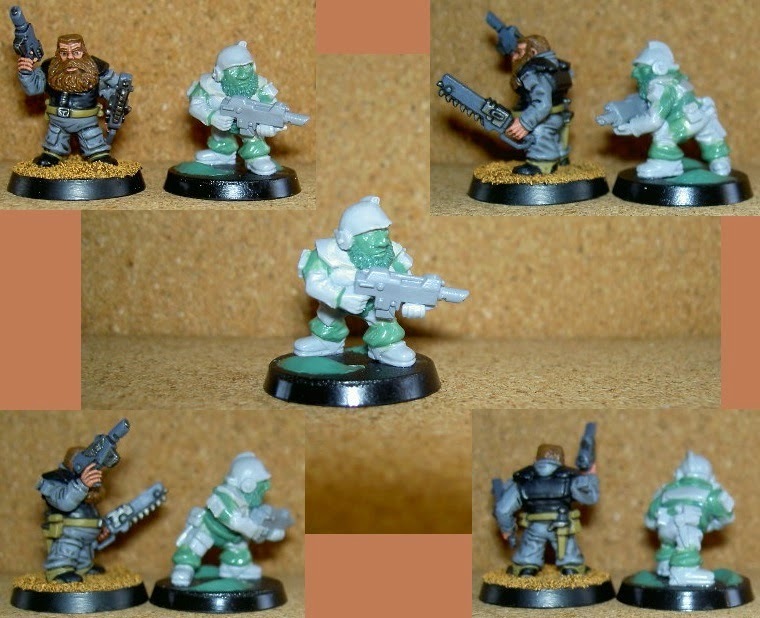 But it looks like the cadian ones work well too judging by what you did with this one. Looks like you cut the sword to size. Looks good. I am planning to convert the six that were loose into Squats (like the one above) and then see what happens. 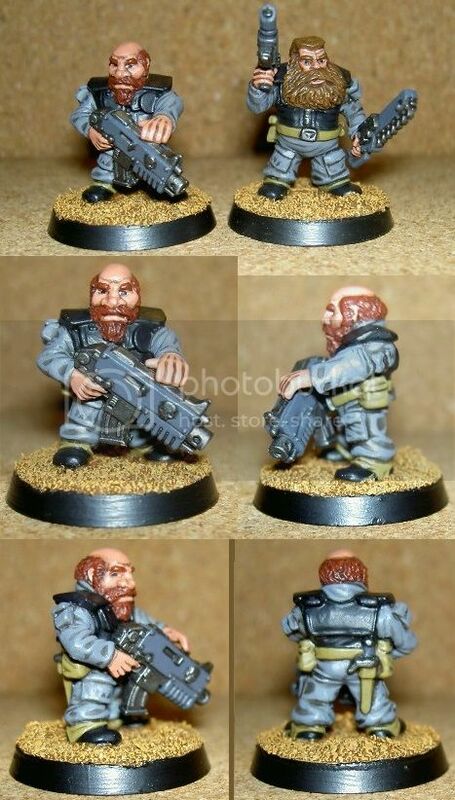 I have nearly finished the second one and he is carrying a bolter. He is also a bit shorter because I have removed a section from the torso. Shortening the torso has worked well . The next one will be a bit more involved because I'll have to sort out bent legs rather than straight ones... so a little more chopping and sculpting will be involved . 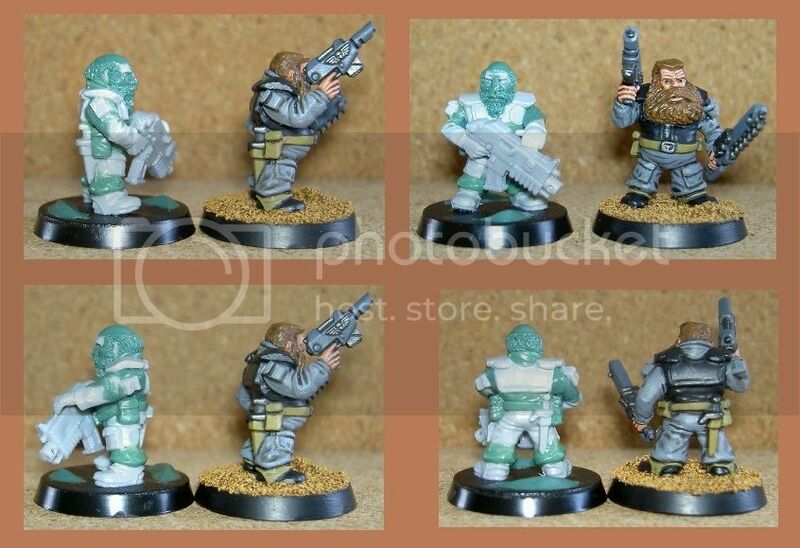 I have just finished stripping a load of plastic squats and imperial guardsmen - they are supposed to be going on ebay .......... damn you Inso you are giving me ideas ! Good! 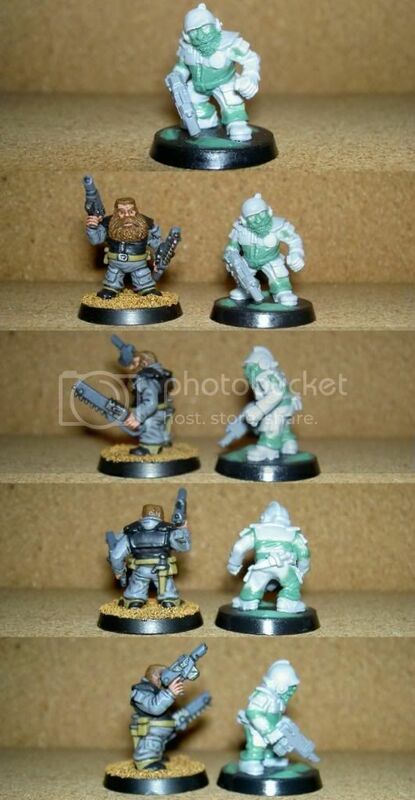 I like to give people ideas ... at least you have some squat bodies to compare your converted guard with. I have nearly finished painting No2 and have started converting No3. He is a 'lunging' miniature and he needed a bit of extra chopping but he looks OK. He is the first one with a helmet on too... it is the 'make or break' miniature for the helmets so it will be interesting to see what he looks like. The lunging body was also less detailed and had glue around the chest/shoulders so he will need a little bit of extra putty work... I should have some pix soon. Looks good to me. Like the work you have done on the faces. The choice of lasgun fits the miniature very well too. The plastic bolters seem a bit big for them imo. Dude, you have some of the coolest ideas! 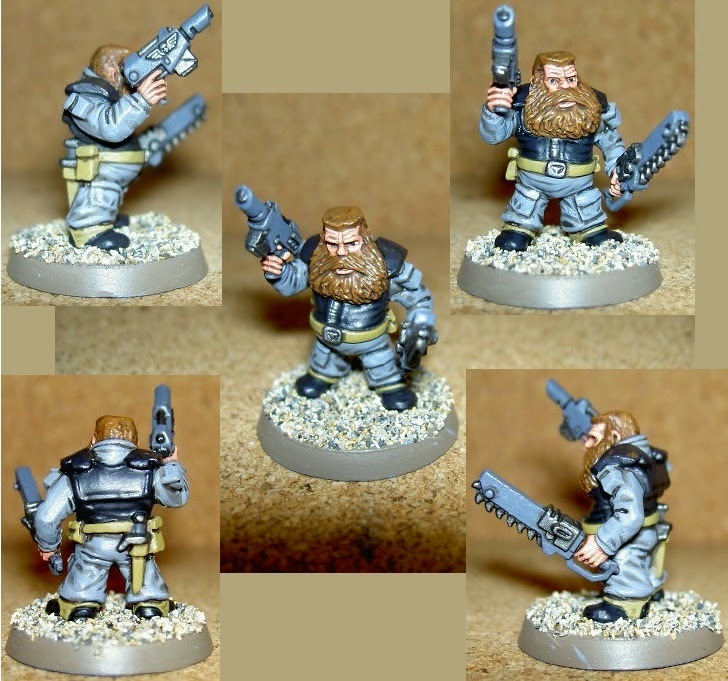 Number four is almost finished too... he's got a las-carbine like number 3. Just a belt and face to sculpt... and a bit of a tidy on the arms. Here is a question... 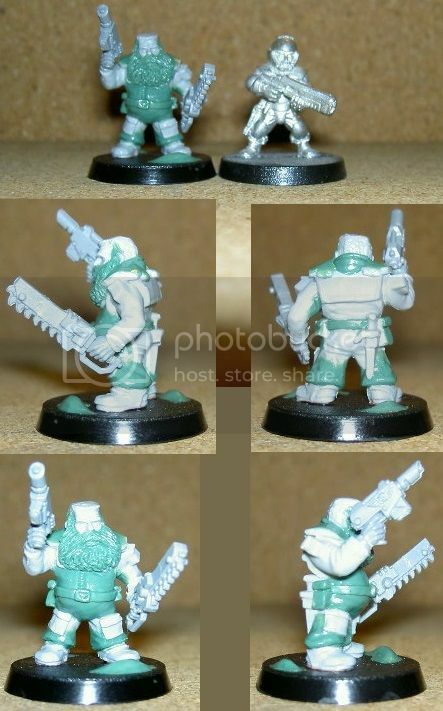 I have a box of Tau firewarriors and I was wondering whether to make some Squats with some Tau weapons and equipment. Does that sound like a good or bad idea? Maybe use the weapons, chests and arms (with extra finger on the hands... Tau only have three fingers) of the firewarriors but the chopped down legs of a Catachan. The third one has been base-coated and washed ready for highlights and basing . looking good as always, does the box come wiyh any support weapons. There are lascannons in the box but they are the old OLD shoulder mounted ones... however, I will be using some (even if it is just for a heavy squad). I also have some other support weapons from the latest IG boxes so they may well be used as well. Support squad (6 troops, 3 with heavy weapons). I'm not sure you don't do this sculpting thing for a living. Even though I remember seeing photos and reading your posts about raf stuff in Africa and the splat decal in that airfix helo kit. Really liking what you are coming out with here. I'm glad you like them . I am not at a standard that I would be comfortable selling wholesale yet. When I am, I will think about it but I am happy with the occasional commission. My full time job is very intense... I am part of the team that is bringing Puma 2 into service and there is a LOT of stuff involved with that. I need something to take my mind off things (my hobby) not add to all the stress .